Annals of the Missouri Botanical Garden, 82(3): pp. 440-470. The baobabs (Bombacaceae: Adansonia) are tropical trees native to Africa, Australia, and Madagascar but dispersed widely by humans. The members of the genus are united by several derived characters that serve to distinguish them from other Bombacaceae, including a characteristic, indehiscent fruit with reniform seeds and a powdery pulp. 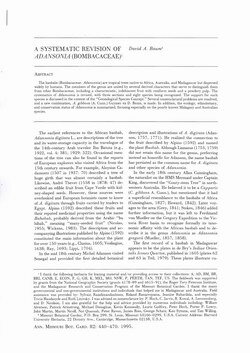 The systematics of Adansonia is revised, with three sections and eight species being recognized. The support for each species is discussed in the context of the "Genealogical Species Concept." Several nomenclatural problems are resolved, and a new combination, A. gibbosa (A. Cunn.) Guymer ex D. Baum, is made. 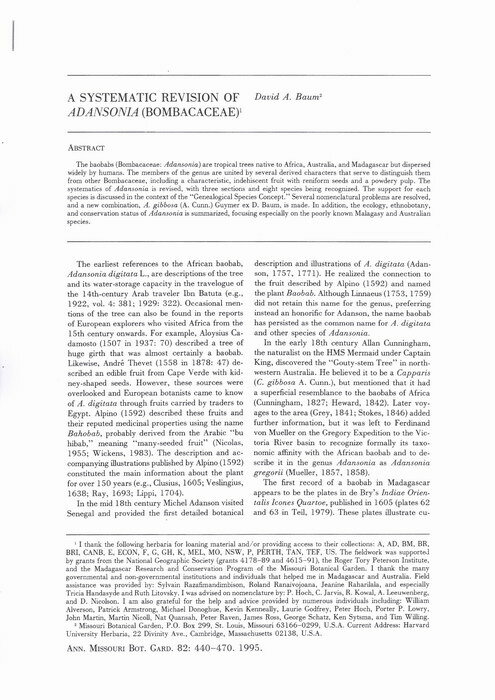 In addition, the ecology, ethnobotany, and conservation status of Adansonia is summarized, focusing especially on the poorly known Malagasy and Australian species.